Political cartoonist Musa Kart was among more than a dozen staff members arrested in yet another raid on a Turkish media outlet yesterday, the latest development in a government crackdown on the press following a failed coup attempt by some members of the military in July. 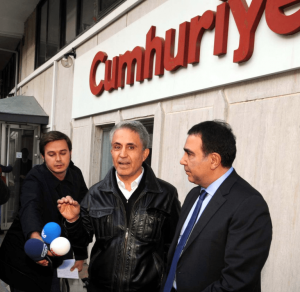 This time the target was Cumhuriyet, one of Turkey’s largest and oldest newspapers. This is a comedy. You cannot scare anyone with this sort of oppression. No person with a conscience can accept this picture. You cannot explain this to the world. I am being taken into custody just because I draw cartoons, exclusively because of cartoons. I think everyone will be able to put this in perspective. I’m not going to surrender… I have nothing to hide, no reason to run away… Everything I write and draw is out in the open. As of this morning, Kart and more than a dozen colleagues remain in custody. Meanwhile, the banner headline on today’s edition of Cumhuriyet read: WE WILL NOT SURRENDER.